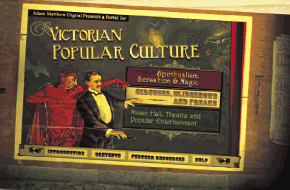 Just released, to those who can afford £9,500, a huge online collection of images of Victorian stage magic, circus sideshows, and the fantastic supernatural in popular culture. Which inspires the thought that an investor might do worse than make a collection of today’s worthless popular ephemera, and stash it in a vault for 120 years for the benefit of the great grandchildren. There’s obviously gold in trash, if it hangs around long enough, falls out of copyright, and you’re the only one left holding a stash of it. Although by that time the copyright fascists will probably have a 1000-year copyright regime in place. In the absence of you finding £9,500 down the back of the sofa, this Flickr search gets a nice haul of vintage stage magic posters.